A team of five students from Minot High School are the 2019 Regional Science Bowl Champion. Pictured from left to right are Sam Keeling, Paolo Panales, Ross Hardy, Collin McDonald, and Emily Couse. Every year, students from across North Dakota compete in the Regional Science Bowl, an academic competition in which high school teams answer science and math questions in a question-and-answer format. The questions come from disciplines such as biology, physics, chemistry, calculus, and astronomy. The Minot High School team was announced the 2019 Regional Champion, after defeating the returning champs, Century High School, in the finals on Feb. 2. 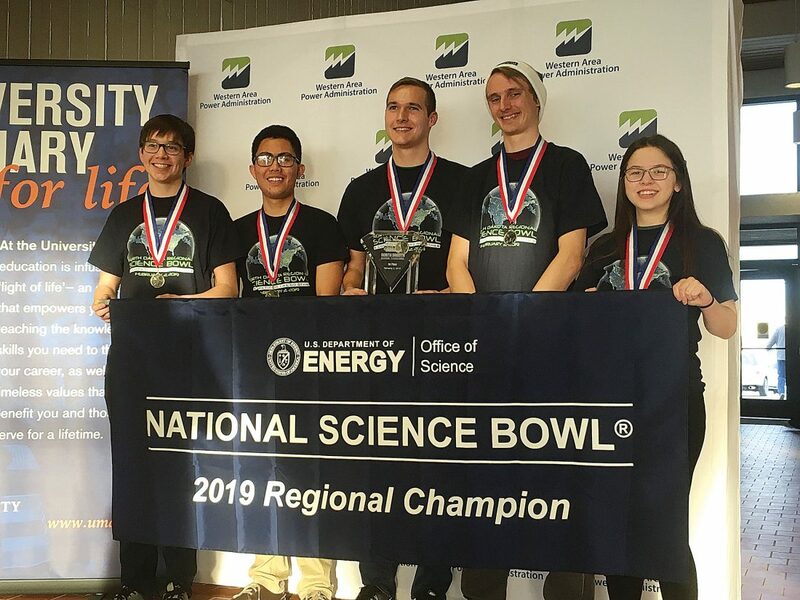 The MHS team along with their coach Gene Curtiss, will be attending the National Science Bowl in an all-expense-paid trip to Washington, D.C., in April. The last time Minot High won the Regionals and qualified for Nationals was in 1998.